The conference takes place at the Château de Bossey, in Céligny, Switzerland. It’s very easy to get to Geneva from Geneva airport, you just have to take a train (they all go to Geneva centre, the train station is called ‘Genève Cornavin’). The journey takes 7 minutes. You can get a ticket for free from the special machine located in the baggage collection area at the Arrival level, by the far left door to exit. Please do this before you exit. More information here. From Geneva, you have to take a train to either Nyon or Coppet (whichever leaves first), where you will change to a bus to Céligny, Village. Actually, depending on when you arrive, you might even take the train directly from Geneva airport. (But please note that the free ticket will only cover travel to Geneva.) You will have to buy a ticket to travel from Geneva (or Geneva airport) to Céligny. More information here. For the exact schedules, and all other information, you can use the SSB website (in English) and enter ‘Geneva Cornavin’ or ‘Geneva Airport’ in ‘From:’ and ‘Céligny, Village’ in ‘To:’. How to buy bus/train tickets: We suggest using the SBB website to plan your travel between Geneva, or Geneva airport, and Céligny, Village. There are numerous ticket machines located in the airport near the train station, and in Geneva Cornavin station. These are easy to use and usually will have staff around (there are also staffed ticket counters at Cornavin, though these can be very busy). You can also (and we recommend you to) buy your tickets between Geneva airport (or Geneva) and Céligny village on the website and then print them at home. Unfortunately, it is not possible to buy return tickets (unless you travel outward and back the same day), so you have to buy a separate ticket for each of the two journeys. Tickets are valid all day (avoid supersaver tickets, which commit you to a particular time). for a couple of hours, and we will try to maximize its efficiency when we will know your estimated time of arrival. Ideally, you should aim at arriving between 11:00 and 13:00. 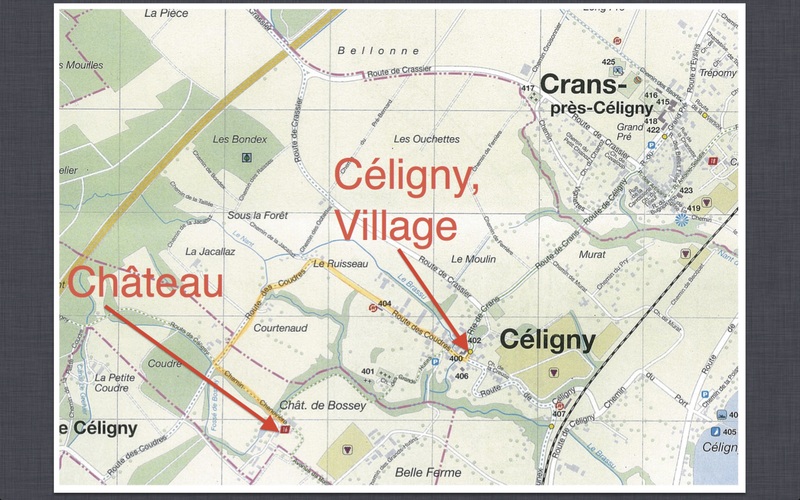 If you prefer to walk, you’ll find a map below to help you with the 20-minute walk between the Château and Céligny, Village. Time of arival: The conference starts officially at 14:30 on June 27th. Lunch is served between 12:00 and 13:30 (catering). When you arrive, just go to the reception and they will explain how things work there, where your room is, etc. In case of a problem, you can call Baptiste: + 41 78 681 38 73. Time of departure: The conference ends at 13:00 on the 30th. A last lunch will be served then (self-service until 13:30). Then, a shuttle will be available to go to Céligny, Village. The hotel and meal are paid for, but not drinks.